Hey, let's not forget cool made in USA products for your dog or cat. And please avoid any treats made in Asia. They are unsafe for your pet. Bumi Tug/ Fetch Toy - tangerine only - Made in USA 1 Left! Bison Designs Dog Leash- 6 foot- Made in USA- ON SALE- 4 LEFT! 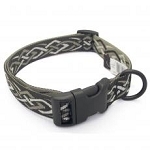 Bison Designs Dog COLLAR- 1" WIDE- Made in USA- ON SALE- 4 LEFT!